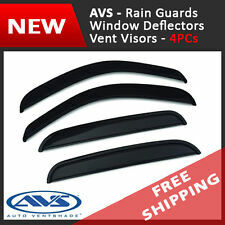 AVS Original ventvisor's customized design mounts in minutes to the outside of your vehicle using pre-applied 3M adhesive mounting tape applied above and around your windows. The ventvisor, also referred to as a side window deflector, window shade or rain guard, allows fresh air to naturally circulate through open windows while keeping the rain out. It was removed from a 1974 Chevrolet Malibu 2 door and has wear from 40 years of use and a small crack. You'll be cooler in the heat and keep dry and comfortable in the rain, all because you can keep your windows open just the right amount. This warranty does not apply to any product from Lund International’s direct or indirect subsidiaries. It is also common for the auto safety feature of electric windows to kick in making the windows wind back down as sensing an obstruction in the window. 100% genuine products! We will try our best to reduce the risk of the custom duties. Very nice new reproduction blue plastic transparent bug deflector. mounts to your center molding on your hood. Very nice new reproduction red plastic transparent bug deflector. mounts to your center molding on your hood. Very nice new reproduction green plastic transparent bug deflector. mounts to your center molding on your hood. Hot Stapler Bumper Fairing Repair Tool Plastic Cut Connect Welding Gun For Car Auto Motorcycle. 1 Pcs x Hot stapler unit. -The ideal way to repair most modern products which are made of plastic. -Perfect for repairing : cracked bumpers, head lights, plastic wings and much more other plastic products. Material:Silver Coated Reflective Material. 6pcs/set Car Windshield. Fits for All car models. Dual side mounted, ready to put the glass onboth sides, the effective reflection and isolation heat conduction and reduce the temperature inside the car.